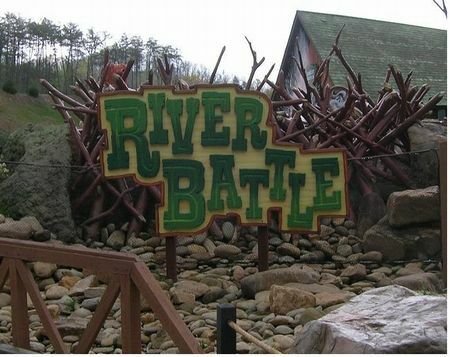 River Battle is a boat ride in Wilderness Pass at Dollywood. While it's not the best, it is also recommended. Opened in 2008, River Battle is an interactive boat ride where each passenger uses a mounted squirt cannon to soak more than 100 stationary targets, as well as other boats. Nine rafts carry eight passengers each, for an hourly capacity of 800 riders. The ride is similar to Splash Battle at Legoland California and Buccaneer Battle at Six Flags Great America. While there is no minimum height requirement for this attraction, anyone under 48 inches tall must have a companion 16 years or older.